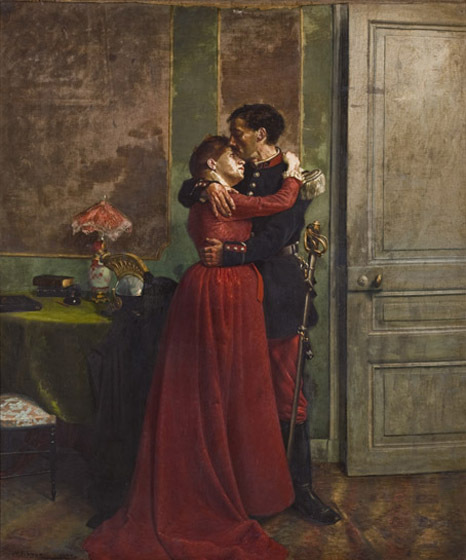 The romantic content of this painting is unusual for Trego, and there are no other comparable works before or after 1890. It is not known whether he painted this in Paris or after his return. If it was done after his return, it likely reflects his emotional state in the weeks following the sudden end of his engagement to the young French woman Leonie Herpin, who he had hoped would become his wife. The face of the weeping woman in the painting is not Mlle. Herpin, however. Trego sent the painting to Edward H. Coates, President of the Pennsylvania Academy of the Fine Arts, in October 1890. There is no record of the painting being exhibited at the Academy, however, so Trego's reason for sending it directly to Coates is unclear. Perhaps Coates had a personal interest in the work or it was submitted for exhibition and rejected. It was apparently not among the paintings that PAFA agreed to store for Trego starting in 1891. Coates is known to have purchased another Trego work, the so-called Cavalry Sketch, which he donated to the academy in 1921. The last known owner of the painting, the Jersey City Museum, closed in December 2010 due to financial problems and is not expected to reopen. The status of this painting is unknown at the present time. The painting has several condition issues. The canvas has wrinkled and needs to be restretched. It also has suffered some paint losses and is in need of cleaning.